If you ask, where did all the money for Haiti go, one answer is: not here. 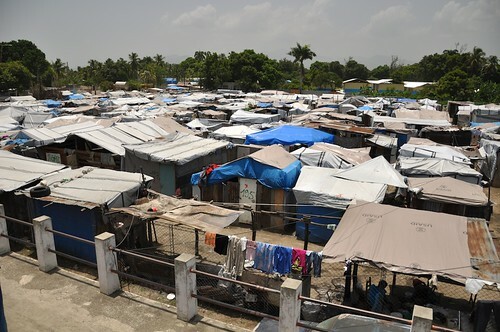 When the earthquake rumbled up from the earth directly below Leogane, 20,000-30,000 people were killed, and 80 to 90 per cent of the town's concrete buildings were reduced to rubble. And, chunk by chunk, shovelful by shovelful, that's some of the rubble that Saint-Fort Mackenson and the other members of his work crew are clearing away. 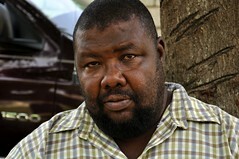 Mackenson, a thin young man with a mop of plaited hair, pauses to lean on his shovel and wipe the sweat from his face. Their wages, paid by an aid organisation, are $5 a day. 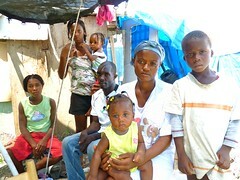 “The money that they pay is not enough for our needs,” Mackenson said with a shrug. Still, its a job - something few people in Leogane have these days. Reconstruction, many people here have concluded, will be a do-it-yourself job. In a few places, we saw men rebuilding houses, but nothing on the massive scale that would be needed to re-house the town's population. The builders said they've given up on any hope of help from the UN, the US, or the international aid community. Leogane may have been at the epicentre of the earthquake but it hasn't been at the centre of attention in the six months since then. Many people here feel virtually forgotten. The Place St Rose camp in the centre of town has become a semi-permanent home to more than 3,000 people. Its full of half-naked children and harried-looking women. As Ferdinand spoke, women washing and braiding each other's hair nearby nodded and muttered in agreement. Ferdinand said the biggest single need for his neighbours was adequate shelter. Right now, their dwellings are made from plastic sheets stretched over scavenged scraps of wood and a few bits of corrugated metal. These huts will be smashed flat by the first hurricane winds to blow through. We caught up with Leogane's burly mayor, Alec Santos, outside the tent where he has been living, next to his badly damaged two-story home. He said from his perspective, it looks like the earthquake might have happened yesterday. "I heard there was so many millions going to Haiti, but I haven't seen it. I've heard a lot of promises. Promises, promises, promises. I'm hoping in the next few months I'll see some results." If things haven't improved much for most people here, for some, they may be about to get worse. Inside a sweltering hut outside of town, we met Aurelien Joseph feeding porridge to Marie Jose, the youngest of his four children. The family has lived here, on privately owned land, since the earthquake, along with hundreds of others. Now, Joseph said, they have only a few days till they will be evicted. Many of Leogane's churches were badly damaged by the quake, but that hasn't stopped people from worshiping. On a weekday afternoon recently, hundreds of people packed a new church set up in a large tent near the city's central square. They sang, clapped and twirled their rosaries as a lay deacon led a procession around the altar, holding high a representation of the crucified Christ. In the past six months, many visitors have admired the Haitian people's great resilience, perseverance, and unswerving religious faith. In the end those qualities may be worth much more than the millions of dollars in aid - money that so far has done little to help them rebuild their lives.